More than 700 sophomores from Vantage Career Center’s 13 associate school districts came to Vantage on Wednesday for “Sophomore Visitation Day”. Each sophomore had the opportunity to investigate and explore two different career technical programs of interest to them. During each one-hour visit, there were hands-on activities, demonstrations, and presentations prepared especially for them. 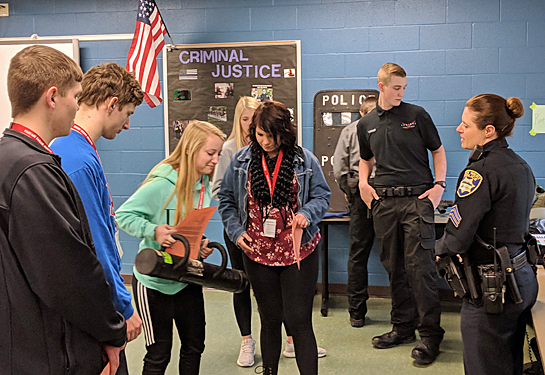 Vantage Cosmetology students staged a fashion and style show for the 10th graders, while those visiting Welding got a chance to try out the virtual welder. Visitors to Auto Body used their artistic talent to create an airbrush painting and practiced using the virtual painter program. In Auto Technology, students learned how to use the tire balancer and rim clamp and had a contest to see how quickly they could replace a spark plug. Sophomores in Network Systems got to use some of the latest technology — Oculus 3D Rift Virtual Reality and Google Glass, while those visiting Interactive Media got to work with the 3D printer. In Construction Equipment Technology, students were able to operate a backhoe, forklift, and other large machinery. Here are a few frequently asked questions — and answers — about coming to high school at Vantage. A: Vantage prepares not just career ready students, but also those who are college bound. About 42 percent of Vantage graduates continue their education immediately after high school graduation at a two- or four-year college. Students are urged to check with their school counselor to be sure that all requirements for college entrance are met. Q: Can I receive college credits through my high school class at Vantage? A: Yes. Many programs have articulation agreements with local colleges that provide some college credit for Vantage coursework. Some courses are College Credit Plus. A: Yes. Students are encouraged to stay involved in extracurricular activities at their home school, such as sports, pep band, drama, etc. Q: What is the tuition to attend Vantage? A: There is no tuition to attend Vantage. Each program has a fee of $100, which covers the cost of tools, supplies, equipment, and one full uniform. Q: When are applications due at Vantage? A: Sophomore and junior students who are considering attending Vantage should be aware that the priority application deadline is March 6. Interested students may complete and submit an online application form by using this address https://tinyurl.com/yd2yad66 to access the application form. Students may continue to enroll throughout the spring and summer however, first choice programs may already be filled. Vantage offers 17 different high school career technical programs. For more information, talk to a school counselor or call Student Services at Vantage at 419.238.5411 or 800.686.3944, extension 2032. Those interested in attending Vantage can always check out its website at www.vantagecareercenter.comor like and follow Vantage on Facebook, Instagram, and Twitter @vccstudents. Celebrate Vantage’s 40th anniversary on Monday, February 25, from 5-7:30 p.m. All the labs will be open and there will be special demonstrations and activities. There will be an important Parent Information Session in the Community Room from 6 to 6:30 p.m. designed to answer questions about student opportunities at Vantage. Parents will be able to speak with local employers linked to the program their student is interested in throughout the building. Area restaurants will be onsite at “A Taste of Vantage” for attendees to sample their food for a minimal cost, with proceeds going to the Vantage Student Activity Fund.